'So God created man in his own image, in the image of God he created him; male and female he created them' (Genesis 1:27). Genesis 1:26-27 has served as the locus of most theological anthropologies in the central Christian tradition. However, Richard Lints observes that too rarely have these verses been understood as conceptually interwoven with the whole of the prologue materials of Genesis 1. The construction of the cosmic temple strongly hints that the 'image of God' language serves liturgical functions. Lints argues that 'idol' language in the Bible is a conceptual inversion of the 'image' language of Genesis 1. These constructs illuminate each other, and clarify the canon's central anthropological concerns. The question of human identity is distinct, though not separate, from the question of human nature; the latter has far too frequently been read into the biblical use of 'image'. Lints shows how the 'narrative' of human identity runs from creation (imago Dei) to fall (the golden calf/idol, Exodus 32) to redemption (Christ as perfect image, Colossians 1:15-20). The biblical-theological use of image/idol is a thread through the canon that highlights the movements of redemptive history. In the concluding chapters, Lints interprets the use of idolatry as it emerges in the secular prophets of the nineteenth century, and examines the recent renaissance of interest in idolatry with its conceptual power to explain the 'culture of desire'. 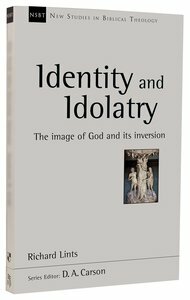 About "Identity and Idolatry: The Image of God and Its Inversion (New Studies In Biblical Theology Series)"
Richard Lints isAndrew Mutch Distinguished Professor of Theology at Gordon-Conwell Theological Seminary in South Hamilton, Massachusetts. Customer Reviews For "Identity and Idolatry: The Image of God and Its Inversion (New Studies In Biblical Theology Series)"
This is a scholarly work that is well worth applying yourself to.Although I found small parts a bit difficult, overall the author gets his point well  truly across, - God  is the reason for all, He created us to reflect His image, and we move away from this at our peril. The mega-narrative of all scripture is our protection against idolatry of this and all ages.Also he gives helpful insights into the church community to reflect God's image and resist the "plastic" images of our day. Overall, quite helpful in understanding what it mean to be created "in the image of God".